In my Navajo culture, we say weaving is life. 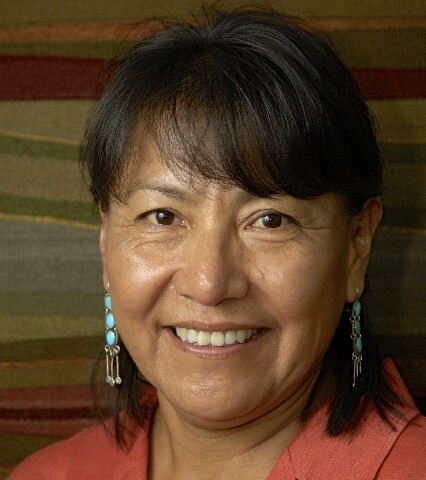 As a Navajo weaver or a Navajo woman, I feel that it is a responsibility to sustain this weaving tradition. It’s just not sitting at the loom. It involves raising sheep …..
1. 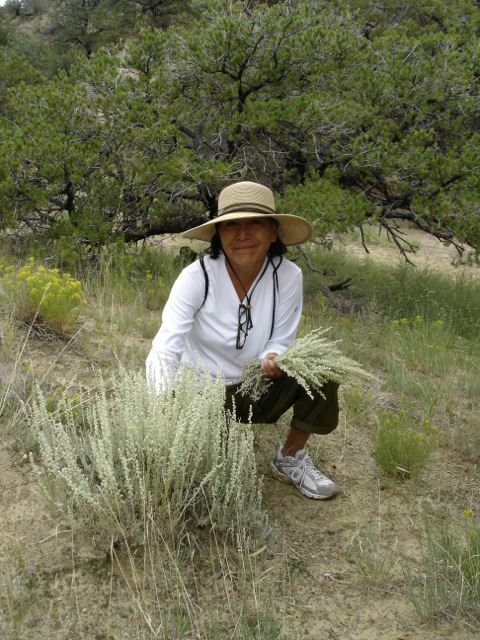 What led you to the mission of being a Navajo weaver? I received an education at Arizona State University. 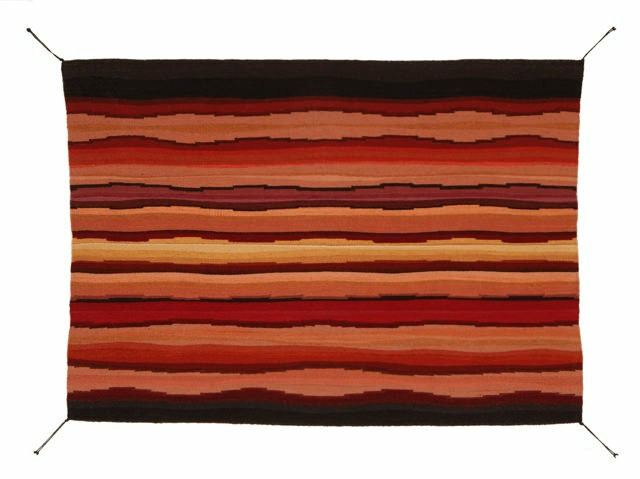 This was the second thing that drew me into weaving and art. I had the opportunity to take some unique weaving classes that inspired me. This also helped me explore and study weaving. I’ve been weaving in this way for about thirty years. I was exposed to weaving as a young girl, but I started weaving all by myself after high school. I wove off and on until I got older and then it became a profession for me. In my Navajo culture, we say weaving is life. That invokes different meaning. Our way of life is a traditional life way. Because of our weaving tradition, we are able to survive and sustain a tradition which is weaving. 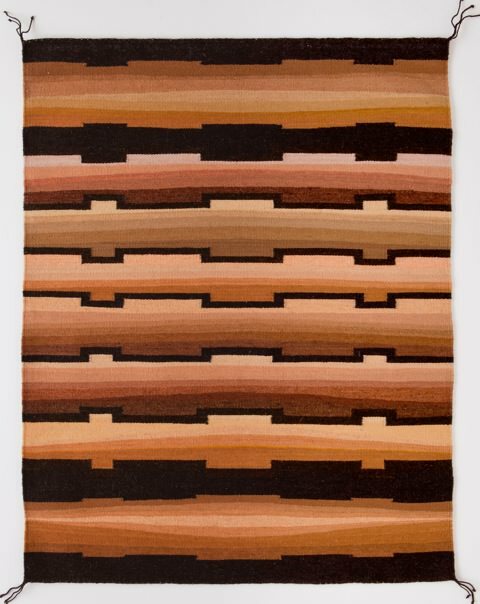 As a Navajo weaver or a Navajo woman, I feel that it is a responsibility to sustain this weaving tradition. The whole process of weaving is weaving as life. Weaving entails sheep – all the way to the finished product. Weaving involves a lot of aspects. It’s just not sitting at the loom and weaving in and out of a warp system. 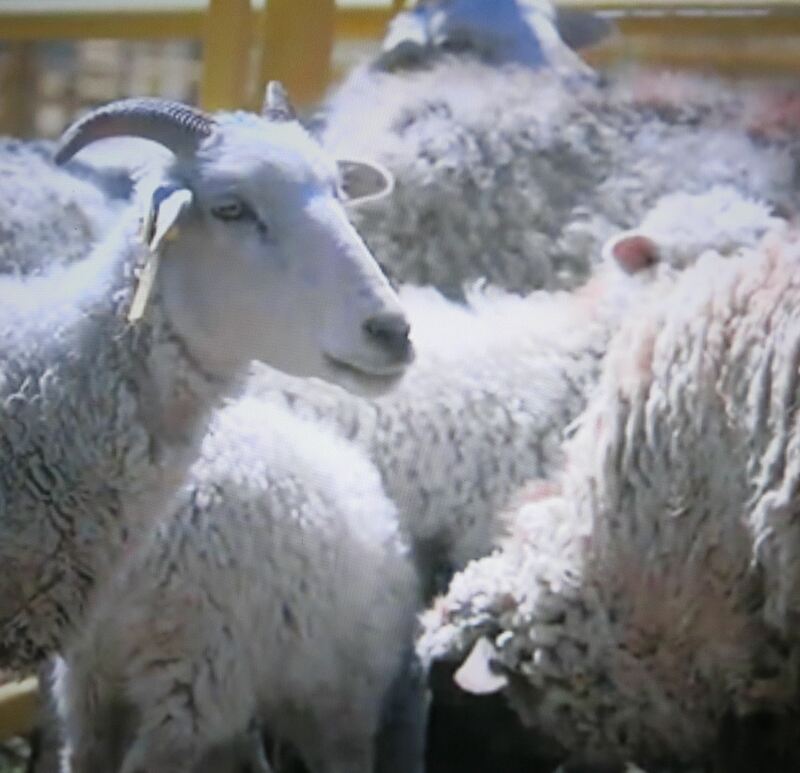 In my Navajo weaving culture, weaving involves raising sheep, taking care of sheep, and at a special time of year we shear the sheep. We take all the hair off the sheep. We get to keep some of the wool for our weaving. The shearing comes first and then comes the cleaning and caring of the wool. This is the process of carding, spinning, and dyeing the wool. Then there is the process of dressing the loom, designing the loom, and finishing the weaving. So it is a pretty broad topic. 3. What was your best day as a Navajo weaver? My best day was at a particular time as a weaver in the 1980’s when I started experimenting with natural dye. 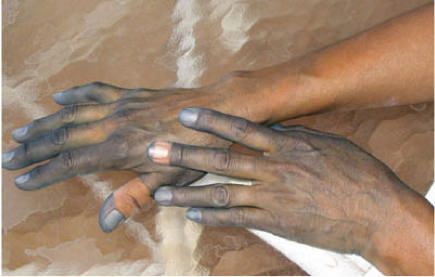 The first project with dyeing was with indigo dye. It’s not an easy process. It involves a lot of chemical setting and vat setting. My first attempt at indigo vat setting was a success! I was very fascinated and excited and intrigued. The magic was the color. 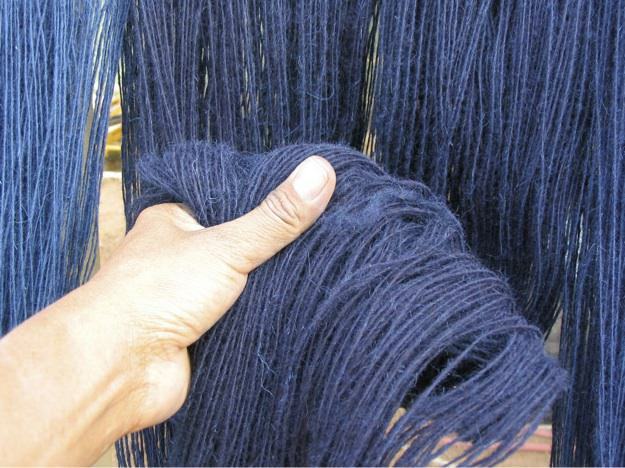 I think of my weaving as each day being a good day, but the indigo dye process was a highlight. It just excited me. That came to my mind as a very successful and best day for me. This might be different from a normal day to a person who is not a weaver. But to me weaving is not just an act of putting yarn in and out of the warps. 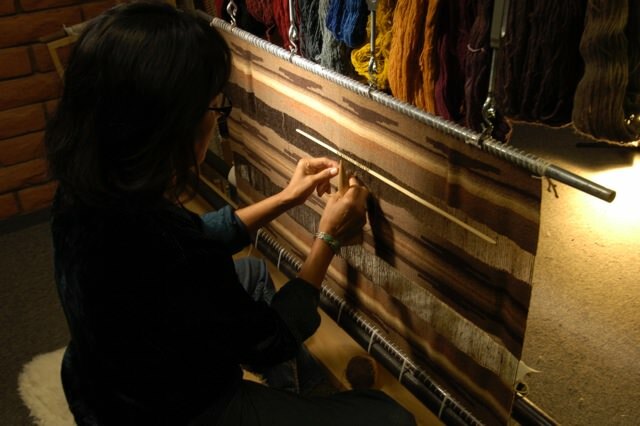 There are many other aspects of weaving that can be exciting and rewarding. 4. What was your worst day as a Navajo weaver? I always look on the bright side and the positive side of life. But I remembered one of my worst days. One day I finished a tapestry. I decided to steam the finished tapestry to straighten and flatten the weaving. As soon as I did that, the tapestry instantly collapsed, shrunk, and curled. That was a bad, bad day for me. It was very embarrassing and it was very shameful. I do some consulting with museums and do fiber analysis and documentation. I found that this was an incidence that I was embarrassed to share as a textile conservator. The first thing I did was walk out of my weaving room and didn’t even want to think of the accident. It took me several days to look at the weaving again. One of the things that I thought of was the expression, “making lemonade out of lemon”. What I thought about was how I make beautiful pillow covers and give them as gifts. The accident didn’t go to waste. I just turned around and thought about how I could utilize this ruined tapestry. What I did was cut up the tapestry and make beautiful pillow covers. I just couldn’t get myself to throw the tapestry away. Part of it was still good. I am very interested in working with elders – especially listening to their stories about weaving, about a way of life, or what they do. That makes me think that my weaving is not just a profession, but it is more personal to me. I encourage people to try weaving, to experiment, to explore, to listen to other’s stories and to tell their own.